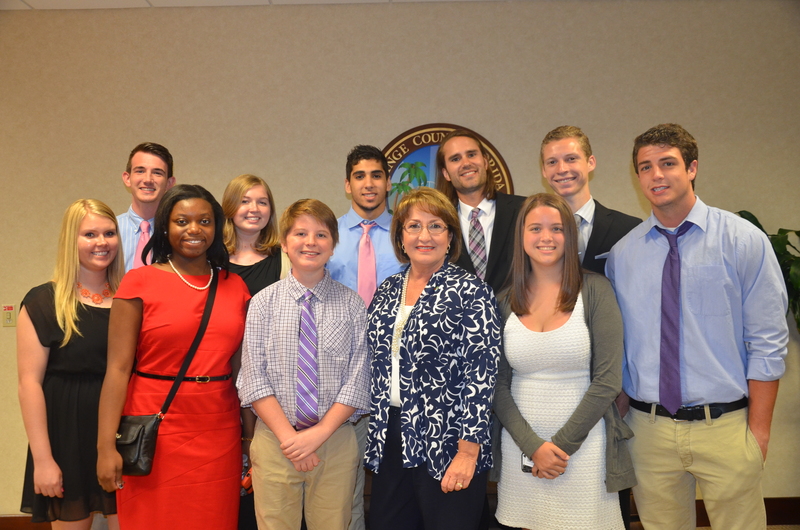 Orange County, FL– A group of bright and talented student leaders from Timber Creek High School have won Orange County Mayor Teresa Jacobs’ 2014 Mayor for a Day Challenge. In February, Mayor Teresa Jacobs hosted her third annual Youth Leadership Conference at Rollins College in Winter Park. Students who attended the Conference were encouraged to post a video on Mayor Jacobs’ official Facebook recapping what they learned at the conference for a chance to job shadow Mayor Jacobs for a day. The Challenge engaged 850 unique visitors, garnered 549 shared links and 253 total votes on Mayor Jacobs’ official Facebook page. Timber Creek High School’s video focused on the issue of bullying in schools. With 191 Facebook votes, the east Orange County high school was named this year’s video challenge winner. Dr. Phillips High School, Timber Creek High School, and Oak Ridge High School submitted their videos through the month of March and April. Joining Mayor Teresa Jacobs in the leadership conference were Orange County Supervisor of Elections Bill Cowles, Chairman of the Orange County School Board Bill Sublette, Superintendent of Orange County Public Schools Dr. Barbara Jenkins, and City Year Orlando Vice President and Executive Director Jordan Plante, as well as members of Orange County’s Board of County Commissioners and school board members. High school juniors and seniors dedicated to public service and bettering their community are also encouraged to share their volunteer experiences and community service activities for the Charles T. Smith Community Service Award. Student nominees should demonstrate engagement and participation in activities or projects that benefit Orange County. For more information on the Charles T. Smith Youth Community Service Award, please visit http://www.orangecountyfl.net/OpenGovernment/OfficeofPublicEngagementandCitizenAdvocacy.aspx.